Many may wonder, what exactly is JWEL and why the odd spelling? Pronounced as 'jewel', it is one of F&N latest premium range of ice cream sticks. JWEL consists of 5 delightful flavours (each with its own English entitlement) - Vanilla, Tiramisu, Double Chocolate, Caramel and Black forest, all of which are coated in a thick and luxurious chocolate topped with almonds. Holding a JWEL in my hand, get it? Jewel. What I would say about the naming of the ice cream is really witty. Each flavour is endorsed with its own English Royal Entitlement. For the photo above, its called The Duchess of Double Chocolate. The other flavours include The Decadent Duke of Vanilla, The Curvaceous Countess of Tiramisu, The Extravagant Earl of Caramel and The Brazen Baron of the Dark Forest. Each member of the ice cream aristocracy is unique in its right, having their own quirky personalities and curious idiosyncrasies. From the left, The Earl of Caramel, The Duke of Vanilla, The Duches of Double Chocolate, The Baron of the Black Forest and finally, The Countess of Tiramisu. Each with its own unique colour and packaging. Here lies the throne of chocolate! Now, you may ask, "where can I get one of those amazing ice cream sticks?". Fairly simple, JWEL is available nationwide at selected leading hypermarkets and supermarkets. The suggested retail price? RM3.50 per stick or RM14.70 per multipack of 4 sticks! It is quite cheap if you ask me! For those who would like to try out how JWEL ice cream taste like, head on down to one of their ongoing roadshows today and receive a complimentary JWEL ice cream worth RM3.50 of the flavour of your choice! Simply "Like" JWEL_Malaysia Facebook page and voila, ice creeeeaaaam! Here I was at the Empire Subang's roadshow. 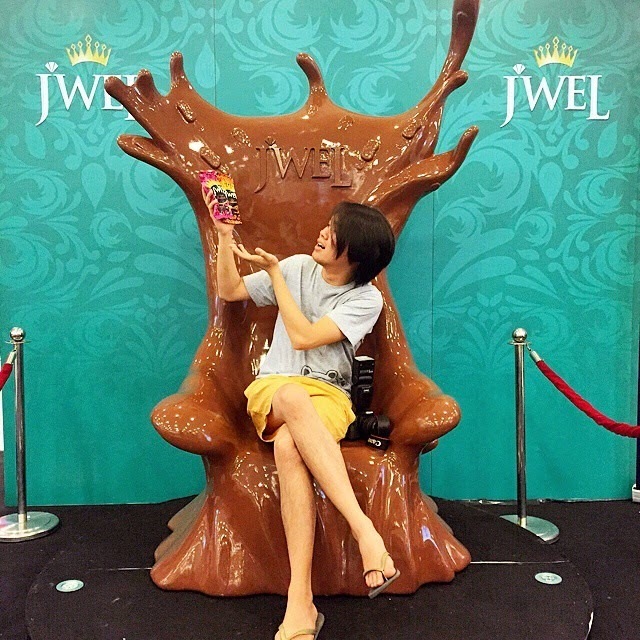 Also, for more updates, promotion, future contests and news, do follow JWEL Malaysia's Instagram as well. Among so many flavours, my favourite would be the Caramel and Vanilla. I believe these 2 flavours were exceptionally different as compared to many other brands of ice cream sticks. Not only were they coated in delicious almond flecked chocolate, but the cream itself, was smooth and packed with flavour. It also had a nice consistency which was both milky and velvety. And here I am, sitting on the throne of chocolate, holding two different JWEL ice cream sticks and thinking which should I eat first. It may be the first time that I've ever posted a photo of myself here on this blog. It may not be much, but I guess it is something big for me, a leap - a huge leap. So, what are you waiting for? Head on down to one of their ongoing roadshows and try out their complimentary JWEL ice cream!